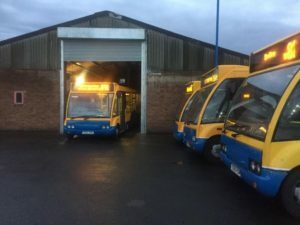 Banga Buses | The friendliest bus transportation service in the West Midlands. The friendliest bus transportation service in the West Midlands. Get the latest company news, see new vehicles that have been added to the fleet, and to plan your journey using our timetables. You can also see details of how to get in touch with the company and any queries you may have. Banga Buses was founded in 2008 and is a family owned company, it prides itself in being a friendly, efficient bus company. All our maintenance is carried out by an external company called BDS Commercials, also our 4 weekly safety checks and servicing is also carried out by BDS. The fleet is yearly inspected by the FTA. We have two sites, one is located on Hickman Avenue whilst the other one is located on Vicarage Road. All information that has been provided has been updated and is correct at time of publishing. If any other information regarding timetables and services is needed don't hesitate to contact us.